NSF1 is a project Jeep Wrangler Unlimited being built as a joint venture between two giants in the automotive aftermarket—Total Truck Centers and Performance Corner—to benefit the Navy SEAL Foundation. This video series will highlight the installation, features, and benefits of products donated by sponsoring program manufacturers. Though this is not a paid review, this content has been produced by The AAM Group™ in support of manufacturers with whom it has a business relationship. Come inside the Total Truck garage as we take you through the installation of some of today’s hottest truck accessories. 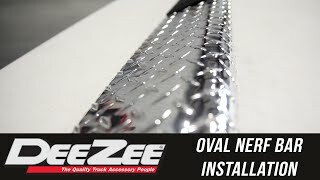 In this episode, Doug Vinsand from Dee Zee comes to our garage with all finishes of their 6″ Oval Nerf Bars to install on a 2016 Ram 3500. Paramount Automotive announced three new product offerings in the best way possible: by hitting the trails at the 2016 Moab Easter Jeep Safari thrown by the Red Rock 4-Wheelers in Moab, Utah. 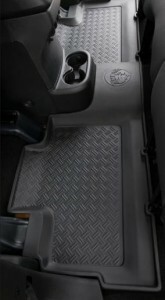 First up is the completely new lineup of Traildriver series black rubber floor mats and cargo mats. With a 2” raised sidewall, custom contoured fit, and a hook attachment to keep them down, they proved more than capable of handling all the dirt, mud, and spilled drinks Moab could throw at them—without sliding, bunching up, or getting in the way. The company currently offers floor mats for 2- and 4-door 2007–2013 Jeep Wrangler JK, and cargo mats for 2007–2016 JK 2D and 4D models. Traildriver floor mats are proudly made in the USA and offer a custom fit and unmatchable toughness. Paramount is known as a manufacturer of Jeep bumpers, and they did not disappoint their fans in that department at this year’s Moab extravaganza. Most popular was perhaps their new LED front bumper for 2007–2014 Jeep Wrangler JK. Manufactured from durable 5/32” steel sheet and 2-3/8” tubing, the bumper offers an optimal balance of material strength for the weight. The bumper comes with everything seen here, including the LEDs and 4.75-ton D-rings; what’s more, it is pre-drilled for mounting a 12,000-lb. winch. Fans of the brand have taken note of improved construction quality and finish durability, thanks to Paramount’s focus on improving manufacturing processes that now integrate high-tech robotic welding and CNC equipment. These upgrades translate into increasing quality and cost savings that can be passed on to the customer, and allow Paramount to offer the added security of a 3-year limited warranty on each bumper sold through authorized vendors. Finally, Paramount is anything but just a bumper company. They used the trip to Moab to help support local businesses in the area, and it turns out Atomic Tours in return would rack up serious mileage on Paramount’s new line of Jeep Wrangler Safari Doors. These doors add a definite sense of adventure to any Jeep outing. They install easily onto the OEM hinges with no modifications needed. 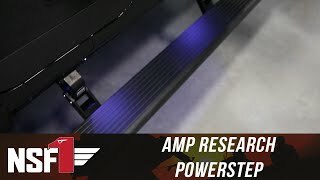 They feature an adjustable striking mechanism to ensure proper fit, and are made with the same high-tech technologies as the company’s popular bumpers, fender flairs, grilles, and other accessories. Paramount’s presence at Moab is a clear reminder that they are an engaged member of the Jeep off-roading community, willing and able to tackle the hardest trails with serious products able to satisfy both form and function. With their highly competitive price points, 3-year warranty, and visually appealing products, it is fair to say that message was received loud and clear. To find your nearest Total Truck Centers affiliate, see our Store Locator. Or join the conversation at the Total Truck Centers Facebook page!